Today I have a quick gift-card card to share with you for iCopic. 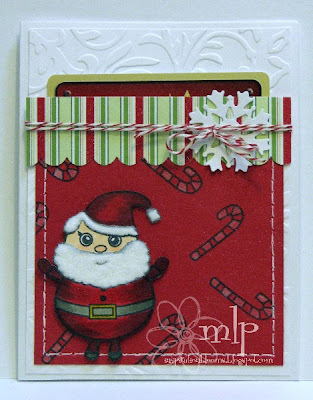 I used stamps from SP & Co and created a quick pocket on the front of my card that will hold a gift card. Santa is colored with Copic Markers and has flocking on his hat and beard. The background is stamped, colored with a white color pencil and then erased for a soft muted look. What an adorable tag! I love that little santa and how you colored him. How do you get such dark shading on his coat? Is it a deeper red or do you come in with black? Love the little touches, too. I have the same question Melissa has! How did you get that dark shading! I love it! So cute. BTW I love the new BLOG LOOK! Thanks for the the love...I simply use two different red markers...I think the darkest one was R89 and the lighter one R29. I feather the darker color on from the outside and then add the lighter color and blend.